Will this cure my MS? No, sorry. There is no actual cure for MS (at least not yet). Some people have experienced very long remissions after a course of alemtuzumab (Lemtrada), and there is some promise for hematopoietic stem cell transplantation (HSCT) in future, but the science isn't quite there yet. Ocrevus is definitely not a cure, or even a "cure," but it also has lower risks than alemtuzumab or HSCT. A full dose of Ocrevus is 600 mg. To give your body a chance to adjust, the first dose is split into two 300 mg doses, two weeks apart. After that, the typical dosing schedule is 600 mg every six months. It is given intravenously, as a slow drip over several hours. Once you arrive at the infusion center, a nurse or other personnel will take vitals and basic measurements like weight. 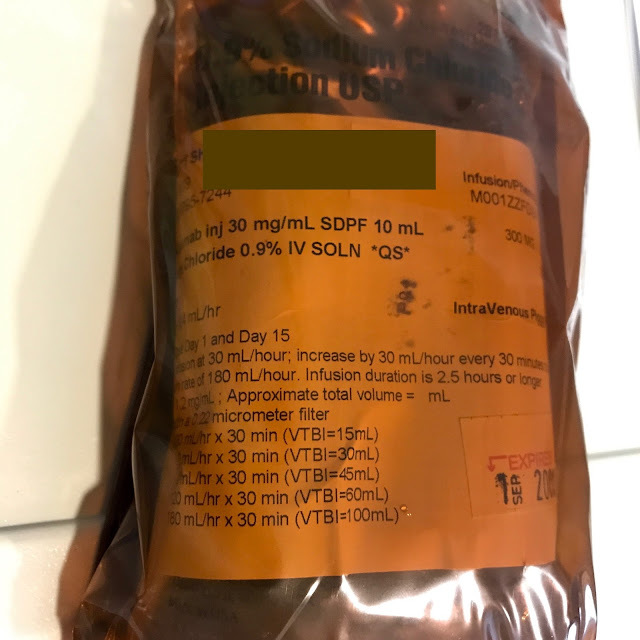 After the IV is inserted, pre-meds include an antihistamine (typically Benadryl, two tabs taken orally) and 100 mg of solumedrol pushed into the IV. This is a much smaller dose than is used to treat relapses (typically 1,000 mg/day for 3-5 days). The pre-meds are given to reduce the chance of an allergic reaction. Remember, Ocrevus is going to be killing depleting your B cells. Your body may get pretty annoyed about this. That's also why they repeatedly check BP/pulse and body temp. The drip is a slow one, and takes at least 4 hours. It will take longer if you have a reaction and have to slow down. I personally have the same reaction every time: a bit of an itchy throat and ears, like my seasonal allergies are acting up. Twice we have paused the drip then resumed. Last time I was antsy to get things moving, so the nurse pushed some more Benadryl and a little more steroid into my line. I took a nice nap and got it over with. With the hour of waiting time afterward, it typically takes me about 7 hours at the infusion center. Bring snacks! Eh...maybe? I thought I experienced some mild hair loss, but couldn't be sure. It just seemed like more was coming out in my hairbrush than usual. I mentioned it to my dermatologist, who recommended I change vitamin D brands (she recommended GNC, although I don't know enough to endorse it) and have my iron tested. I was a touch anaemic, and started iron supplements. I haven't noticed any hair loss since. My primary care doctor also theorized that I had telogen effluvium, a fancy word for stress-induced hair loss. This is also completely possible. I am in the fortunate position of working with a bunch of people who have doctorates in biostatistics and epidemiology, so I ran the cancer data from the trials by them. They said that given that the cancer rate was within normal population limits in the Ocrevus group, the real fluke was that there wasn't more cancer in the control group. Obviously, I keep up on all my recommended screenings, but I'm not very worried. Will I feel worse immediately afterward? Very likely! Again, the drug is killing off altering part of your immune system. I felt like absolute crap after my first half doses, but it leveled off. After the first full dose, I was fine. I even felt energized from my top-up. Will it improve my symptoms? Can I work if I take Ocrevus? I couldn't work without it. My brain is functional again. I did a 3 mile charity walk in the heat two weeks ago. YMMV, but I can't imagine doing what I do without this treatment. I heard that some people on Ocrevus still have relapses. What's that about? Well, it reduces the frequency of relapses, but you still have MS. Per my neurologist, a single relapse or new lesion is not typically enough to pull a person off Ocrevus if they are otherwise doing well. There seem to be some scary things about Ocrevus, and all MS medications. Should I just wait? MS was hiding inside me and progressing for quite a while before the relapse that sent me to diagnosis. I personally refuse to let it progress any farther. Ocrevus is my best weapon in that right now. Nobody can tell you what to do, but I absolutely am very happy about my decision to use this treatment - and I'll likely be first in line when something even better comes out down the road. What other questions do you have about my Ocrevus experience? Throw them at me in the comments! How long did you feel tired after taking the 1st 2 half doses. I feel so tired and weak. I read that it can cause Herpes? Is it oral or vaginal? You can't get herpes unless you have the herpes virus, so Ocrevus can't cause it. Lowering your immune system could cause an outbreak if you already have the virus, I suppose. The type you would develop then would depend on what variety of the herpes simplex virus you have.